"What unites us can be far greater than what divides us." How do you condense an exciting, sometimes nail biting 17-day international sporting event onto one 90-minute DVD? Well, don't ask NBC, because based on this outing they don't seem to have a clue. Sure, most of the big moments are represented here, but they are mostly glossed over on this frantically-paced collection of event footage. As a big Olympics fan, I was disheartened at the slapdash treatment that turned the two-week competitive spectacle into a series of blink-and-you-miss-them clips. All of the Olympic events are covered here (briefly), as well as the opening and closing ceremonies, but the hasty editing completely eliminates any sense of the drama and intensity, and leaves a sometimes confusing set of highlights in its wake. Of course, NBC layers on a somewhat jingoistic tone, but I don't necessarily fault them much for that. After all, Team USA took home a record 34 medals, and the athletes certainly deserve the praise. But this is a world event, and some of the finer athletic achievements from other countries (Austrian downhill racers Stefan Eberharder and Fritz Strobl, Canadian speed skater Catriona LeMay Doan, Croatian skier Janica Kostelic, Australian aerialist Alisa Camplin, Swiss ski-jumper Simon Annmann) are barely mentioned. Figure skating, long the marquee event of the Winter Games, is breezed through with surprisingly little fanfare. We see glimpses of Sarah Hughes' amazing gold medal-winning long program, a few seconds of Michelle Kwan falling, and a millisecond of silver medalist Irina Slutskaya. The men fare worse, with even less attention. The infamous brouhaha in the Pairs, which resulted in a second gold medal being awarded to Canadian skaters Salé and Pelletier, is rightfully covered, but again far too briefly. To make matters worse, NBC felt the need to replace the music the skaters originally performed to with some bad, synthesized elevator music. It was thrilling to see once again that memorable short-track speed skating race with U.S. favorite Apolo Anton-Ohno, where five of the six racers crashed within feet of the finish line. Of course, the emotional skeleton event gold medal victory of Jim Shea Jr., a third-generation Olympian, is a wonderfully moving story itself, though I don't think it was properly explained on this highlight disc to milk the requisite emotion. My daughter Sammy and I were hooked to the television during the Olympics, and when we sat down to watch The 2002 Olympic Winter Games we both felt as if we were on one of those Japanese bullet trains flying past the scene at an extremely high rate of speed. We saw things that were familiar to us, but we just couldn't take the time to enjoy them. Image Transfer Review: No real complaints on the 1.33:1 image transfer supplied here. The quality is no better or worse than what I saw when I watched the Olympics live (or at least "live on tape") on television, and the overall presentation is decent enough. Color depth is consistent from event to event, even when going from natural outdoor lighting (cross-country skiing) to controlled artificial lighting indoors (speed skating). It's pretty much a no-frills transfer. Audio Transfer Review: A disappointing 2.0 stereo is the sole audio option, and NBC should be embarrassed. Bob Costas, who does the voiceover for the various segments, sounds distorted most of the time; I've heard mono tracks with better fidelity. There is just no depth at all to the mix. It's really a shame, because the audio quality during NBC's coverage of the games was quite good, and I had hoped for similar sound on this disc. 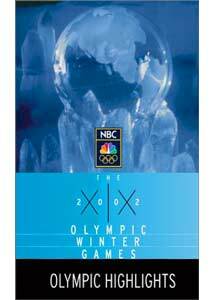 Extras Review: The collection of extra Olympic footage, which runs an additional 45 minutes, is a nice concept because it represents almost another whole hour that NBC could have devoted to the Games on this single disc. However, like the main segment, it is a slightly disjointed collection of interviews, event footage and a handful of medal ceremonies. Personally, I enjoyed the conversation with bubbly skeleton gold-medalist Tristan Gale, and I got goosebumps all over again watching her receive her medal. Moments like that, along with those of Jim Shea and the story of the U.S. women's bobsled gold-medal team of Bakken and Flowers make these extras nice to watch, but I'm left wondering why Derek Parra, Sarah Hughes, Chris Witty and Apolo Anton-Ohno (certainly a few of the more well-known U.S. athletes) didn't merit a mention in this section. I have to figure that an Olympics highlight disc is probably marketed to the very same people who watched, cheered and enjoyed the different sporting events, and the Games as a whole. I'm one of those people, and sadly this collection of highlights conveys very little, if any, of the sense of excitement or competition that made the Olympics such a fun experience to watch. Trying to cover the best moments in over 25 events in 90 minutes is simply impossible. Am I the only one who would have appreciated a multi-disc box set, as was done for the Nagano games?